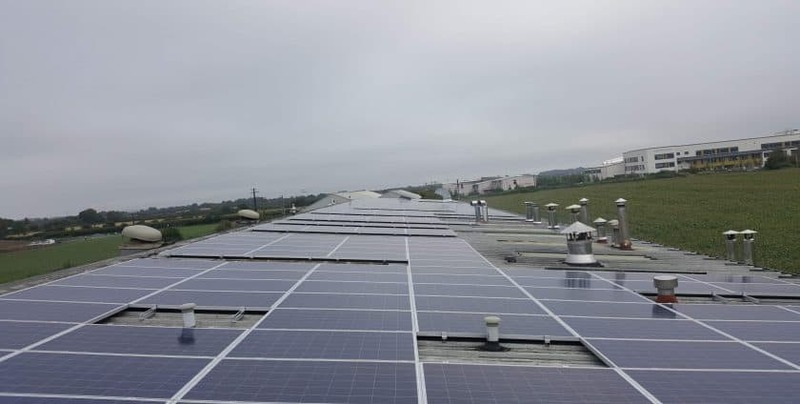 PV Solar Panels were installed recently at McCloskeys Bakery in Drogheda Co. Louth. The aim of the installation is provide solar solution that is sustainable and emission free to their site. This installation will also ensure a significant reduction in the cost of energy for the company. McCloskeys Bakery in Co. Louth is the home of Traditional Artisan bakery on the East Coast of Ireland. The team at McCloskeys specialise in baking the best of bread, bagels, cakes and confectionery. Freshness and quality are the hallmarks for the business which has been a household name for over 70 years. A 100Kwp Solar PV system was installed on this site, using the 275wp poly-crystalline solar panels. These pv solar panels are equipped with an excellent quality mark and an extensive manufactures warranty. The benefit of solar energy and the pv solar panels is that they provide optimum performance throughout the life of the product. This system will generate up to 100,000KWh of renewable electricity per annum resulting in a saving of 60,000kg of C02 annually. Using solar energy Ireland can harness the energy provided by the sun. When you install a solar array, they work on the sunlight rather than heat from the sun. Even on a cloudy day, you will gather enough energy to power your business. Financial support is available for you to install renewable energy at your business. Grants, such as the Better Energy Community is available. At Enerpower we have been very successful in securing grant funding for businesses like yours. A solar pv grant will assist you significantly and reduce return on your investment. We manage the whole process so that you can enjoy the savings. If you would like to find out how you can generate renewable energy for your business with a solar installation, call us today on 051 364 054.